Very happy to present the latest additions to the MT scarf ring collection, complementing the existing honey and black horn rings. The first is bone, which (like the horn) comes from the domestic water buffalo. It is carefully handcrafted by skilled artisans, and all the corners and edges are completely smooth. The colour is soft ivory. The second addtion is Mother of Pearl, which has two different, shimmering sides. One is charcoal gray/iridescent, and the other pale silver. Again, these are handcrafted, and all edges and corners are completely smooth, but as MoP is a hard material to work on, the shape of the ring comes with some slight irregularities. I'm first! - don't know, what for yet, but still I'm first!!! LOL! Yay! Simply beautiful, this makes me very happy, and I just ordered one in each size, the weather is now officially cold (I know you can't live without my weather reports ;) so I can prance around town à la Mai Tai with so many new ways of wearing my H collection. C'est vraiment superbe, j'adore, mille mercis. MT-these are gorgeous! Waiting with much excitement to receive these beauties! xo L.
Yay! More colours! Just placed my order too (and have sent you an email also) - Fantastic additions to the collection, MaiTai! Great! Rings are so beautiful! Let's go to order! 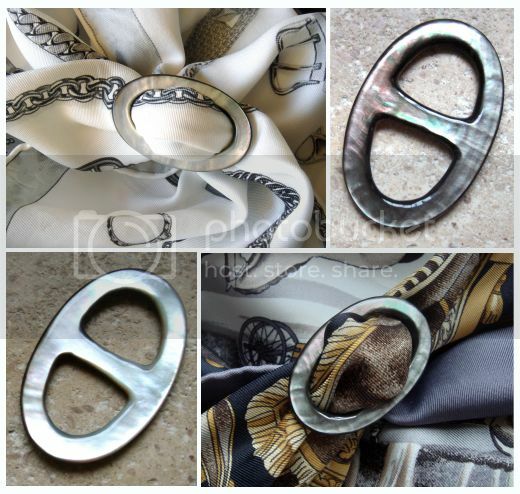 So happy to see more gorgeous scarf rings!I'm looking forward to receiving mine! Keep the MT collection growing please. I just place my order dear MaiTai. Can't wait! These 2 are lovely additions! Yes, the MoP is challenging, so these are especially beautiful. Thanks for expanding your collection and I'm in line also for the faux fur if/whenever! Just placed my order, I can't wait! 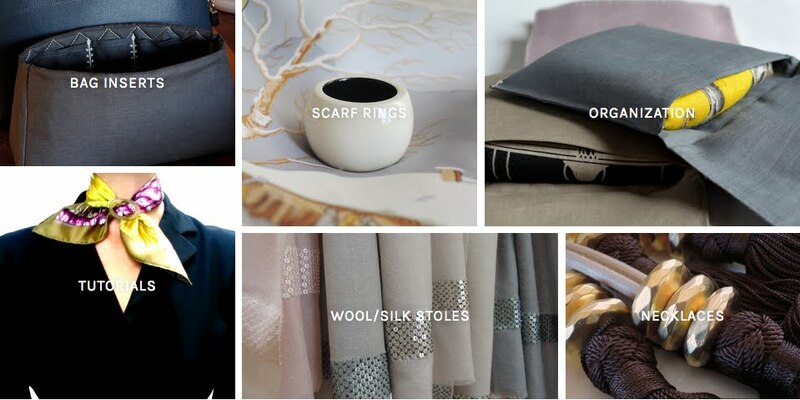 MT you have the most exquisite taste, fabulous ideas and ability to see just what we need! I already have black and honey, and they are just PERFECT!! Winter will be so much more fun with these beautiful additions, thank you! My goodness, I think you must have been inside my mind when I was wishing for a scarf ring in bone. And of course the MoP one is an amazing addition I hadn't thought of (luckily for us you have). I'm waiting forward to trying all of them on!!! Love the M-o-P rings - SO beautiful! You are the classiest of the classiest! Mwah and lol, dearest hair-mess! They are winging their way over to you as well, dear lanit, hope they will be with you soon. I hope they have arrived, my dear sushi queen. So happy you like the new colors, thank you! Your word is my command, dear uyenchikr, and your rings will hopefully be with you soon! Aww, my dear Manuela, thank you! 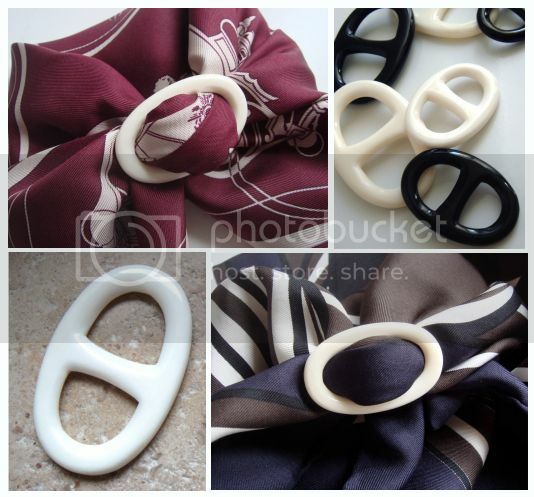 Thank you for the lovely welcome for the new rings, my dear Scarf Enthusiast, so happy that you like them! I am having such fun matching the different colours with my scarves, it is amazing how they can change the overall look so much. Warm hugs to you too, my friend.